You’ve decided to redecorate, but like most people, you know you need help. This is where an interior designer comes in. Hunter Douglas not only sells exclusive products, but they are interior designers as well. Gallery dealers are the most renowned of all Hunter Douglas stores, with exclusive access to the most distinguished product lines, including the Alustra Collection. Authorized Hunter Douglas dealers must also prove themselves with specialized training and certifications in window treatments, interior design, installation and measuring. Hunter Douglas partners with the best in the industry to make sure their products are presented and sold by only experienced professionals. At Windo VanGo serving Baltimore City, we’ll be happy to help you find the right interior designer who can make your house your home. 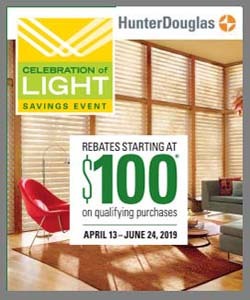 Many Hunter Douglas Gallery dealers have interior designers on staff and if they don’t, they are certain to know a number of designers to connect you with. Whether it’s a small project or a big one, an interior designer or decorator can really help you get the result you’re looking for and can keep you from making costly mistakes. During your first in-home meeting with your designer share what you love about your room. For example, if you love your fireplace, tell the designer and ask what suggestions they have to make it the focal point of the room. Their response is telling on how they will transform the rest of the space. If you find that the designer is not on the same page with you, quickly move on to the next candidate. If you find that you have the same vision, move on to tell the designer what you hate about the room, including how the room makes you feel and the functionality, or lack thereof, in that room. Keep in mind, your personal taste matters and the designer is commissioned to achieve your design goals. Most rooms are multi-purpose. For example, you sleep in your bedroom, but perhaps you also watch TV in there before going to bed. This is an important detail to share with your designer because it influences the placement of furniture, access to technology, and available space design. Likewise, let your designer know if you use your living room every day or if it is only for formal use when guests visit. Other details to share with your designer, include any special needs you have, such as allergies, wheelchair accessibility, or vision issues. The more information you share with your designer, the better your overall experience will be. Do you like cool neutrals in your room with just a touch of color? Or do you want your house full of color? When discussing this with your designer, remember to share the colors you dislike as well as those that you like. After all, you’re the one who will be living with the results, so be sure to provide your designer with samples of colors you love. You can use anything to share the colors you love: a favorite vase, pillow, or dish. Inspiration can come from anything! Although working with a designer may seem intimidating, don’t forget they work for you and have resources that may not be available you otherwise. Also remember that designers are not mind-readers, before you begin your journey, write a list of everything you want to accomplish in each room. Identify how you use each room and what you like and dislike about the space. Windo VanGo is your premier Hunter Douglas Window Treatment specialist and supplier of Farrow & Ball premiere paints and wallpapers in the Baltimore, MD, area, with a gallery showroom in Marriottsville. Serving residential and commercial clients throughout the counties of Baltimore, Baltimore City, Howard, Carroll, Hartford, and Anne Arundel. Contact us today for a design consultation!